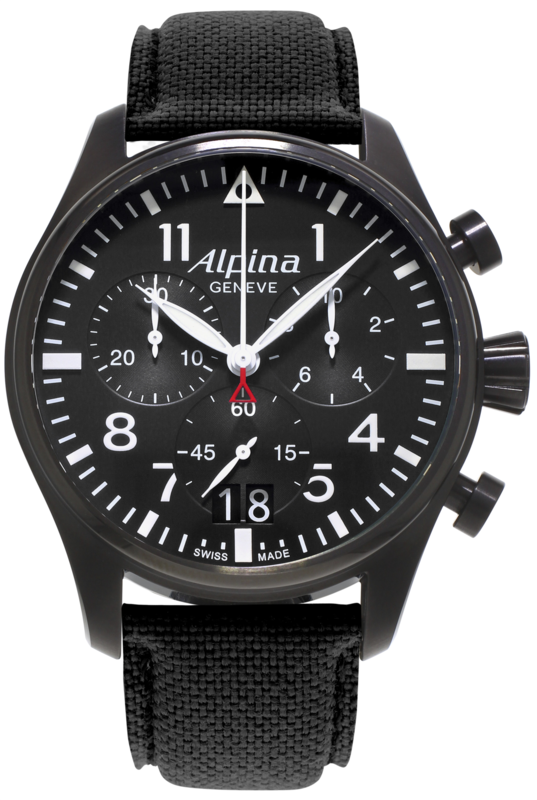 This Alpina Startimer Pilot Black Men’s Chronograph (AL-372B4FBS6) has a matte black dial protected by a black PVD coated stainless steel case and sapphire crystal glass. Driven by a high precision quartz movement, the chronograph also features a centre stop second dial, a 1/10 seconds up to 30 minutes dial and a 30 minute counter, and is fitted with a black canvas strap. The Alpina Startimer Pilot family features a collection of elegantly simple timepieces whose styling pays homage to Gottlieb Hauser’s original vision for the brand. In a nod to Alpina’s legacy as a supplier of watches to several elite air forces across the globe, the Startimer Pilot line is a modern reimagining of the timeless aviator style watch, with this vintage styling given a thoroughly modern update at the hands of Alpina’s expert team of watchmakers at their manufacturing centre in Geneva.